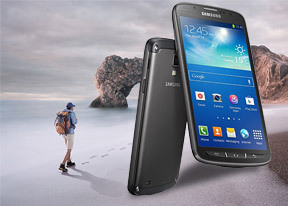 The Samsung Galaxy S4 Active features a wide array of advanced features and applications that really make it stand apart from other flagships. One use case is to play a music track on the Galaxy S4 Active and use multiple phones as speakers. You can pick the role of each phone (e.g. left channel, right) all the way up to surround sound. This way you can control the music from one phone but use the loudspeakers of all. Of course, the other phones will need to support Group Play - the phones communicate over Wi-Fi (your Galaxy S4 Active becomes a hotspot that others connect to) and the pairing is done via NFC. Finally, perhaps the coolest feature of Group Play is that it allows for multiplayer games to be played on several phones simultaneously. Of course, only supported games work - there was a poker and puzzle games preloaded on our unit. It provides a pleasant interface which gives you an at-a-glance look at your progress, as well as walking, exercise, and fitness trackers. S Health also supports a number of optional accessories, which enables it to give even more detailed info on your status. This includes scales that wirelessly transfer their measurements to the phone, where you can see a graph of how you're doing. You can use S Health to track what you've eaten for the day and how many calories you've burned during exercise (with many different types of exercises supported). It also measures your comfort level by keeping track of the temperature and humidity around you.